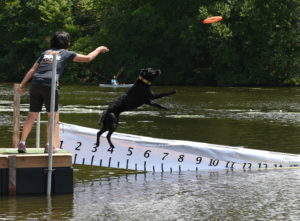 Luna, a Labrador celebrating its fifth birthday, chased a disk thrown by Shannon Murphy of Uxbridge into the water of Springwater Pond in a “Dock Dogs” demonstration that was part of Paws-itively Elgin on Saturday, July 28. Over 50 vendors were on hand for the day-long show for dogs and their owners, along with a lure course and an agility course. The event, attended by over 1,000, was a fundraiser for local animal rescue agencies.